Hidden in the dark depths of Terrinoth, a power-obsessed overlord gathers an army of horrible creatures. His goal: to subjugate the world of the living. A small group of brave heroes becomes the last hope of the free peoples. And so they descend into the darkness to face evil before the world sinks into chaos and ruin. An epic dungeon crawler that is unparalleled. 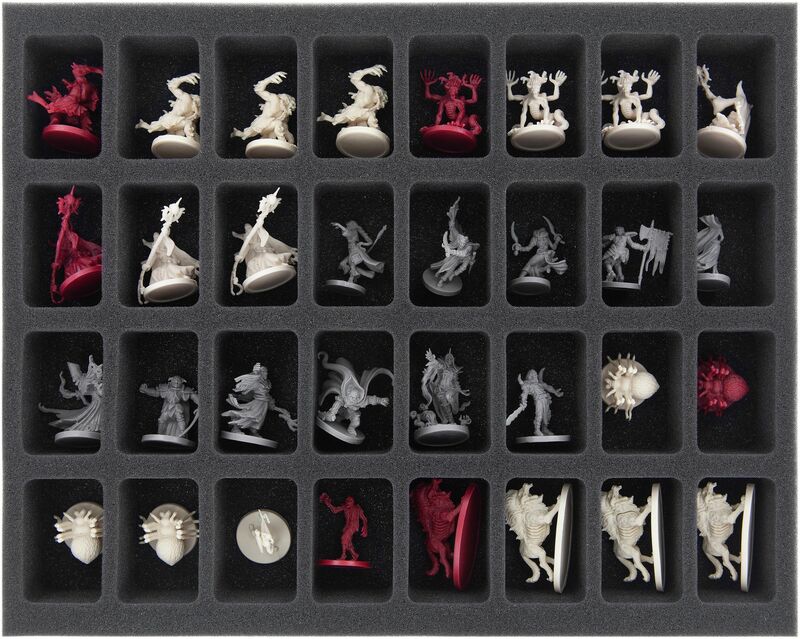 Above all, it is the constantly growing range of highly detailed miniatures that makes this fantasy board game so special. To keep you from sinking into chaos of diversity, we now have the large Feldherr Transporter set for you to safely store and transport this huge Descent collection. 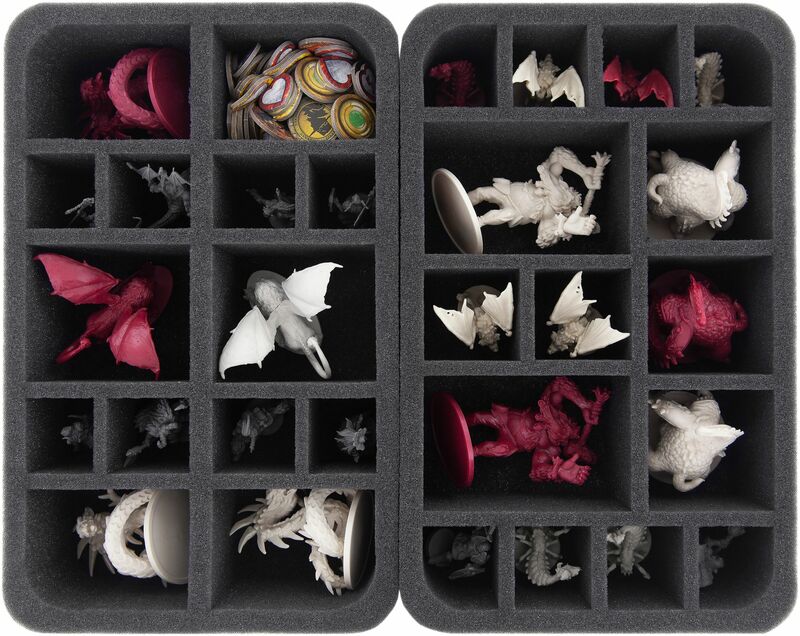 10 custom-fit foam trays ensure that all your hero and monster miniatures are padded softly. 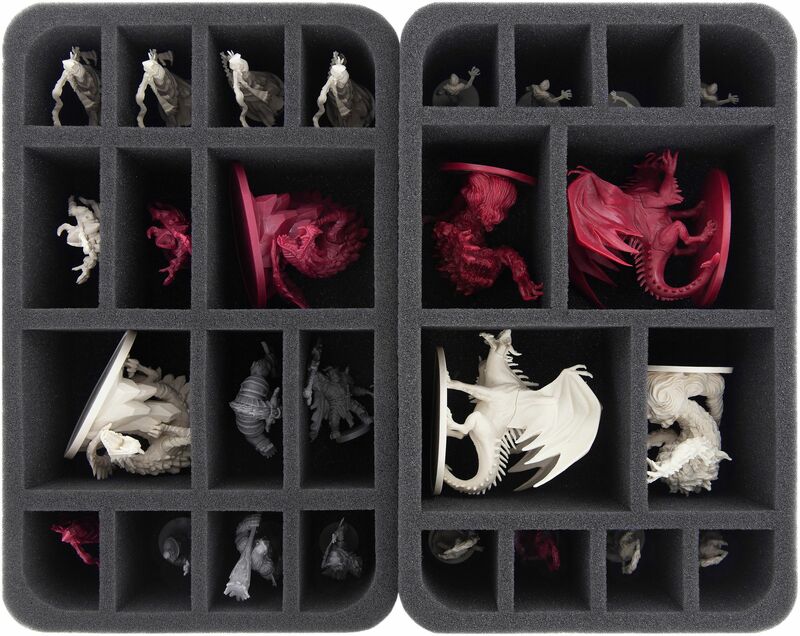 From the Shadow Dragons to the Harpies to the Cave Spiders, there is a suitable compartment for every miniature. A tailor-made mat provides shelter for the allies of the Overlord. 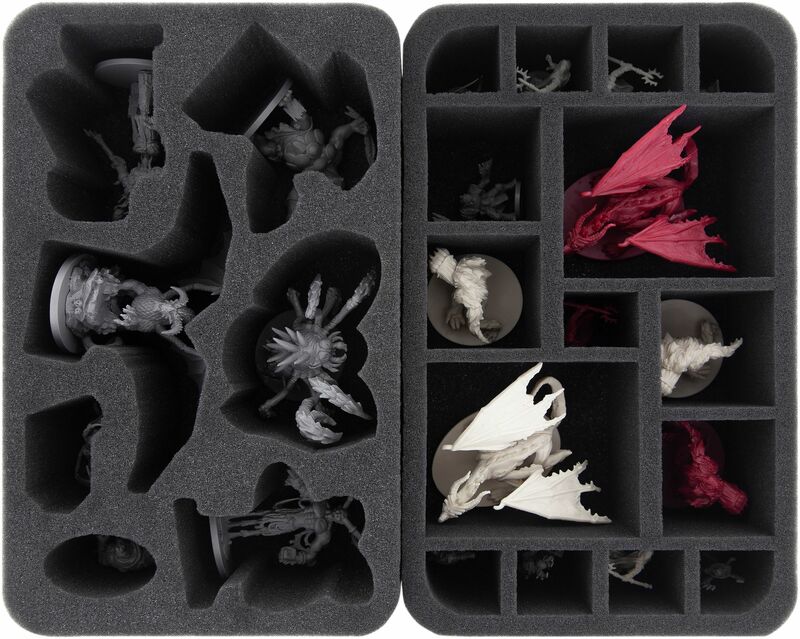 Here, Valyndra, The Rat King, Belthir, Skarn, Sinistrael, Bol'Goreth, and Queen Ariad are given miniature-precise cut compartments. Therefore, sensitive parts of the plastic figures, such as the wings of the Wyrm Queen, are optimally protected from damage. Once you have primed, painted, washed and drybrushed your Hybrid Sentinels and a horde of Goblin Archers in hours of precision work, you know how important it is to store them correctly. 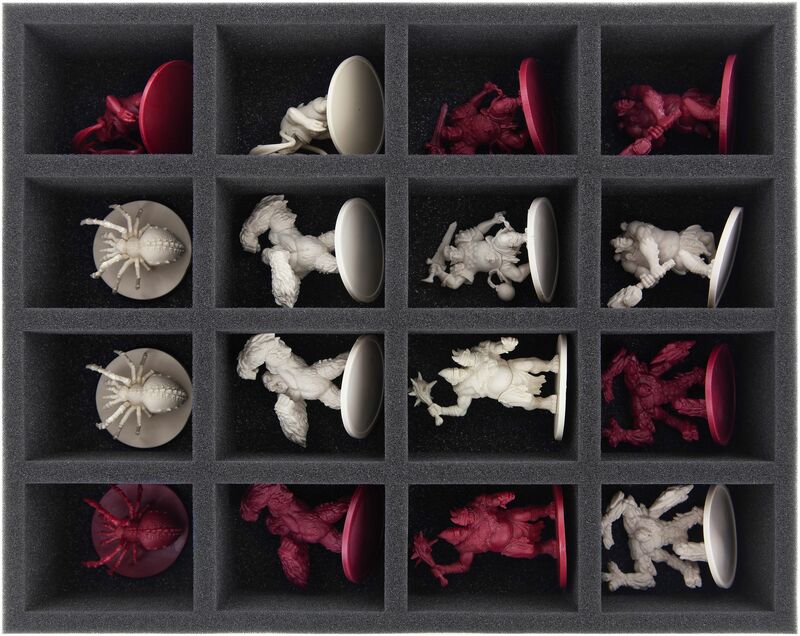 The individual storage of the figures in precisely fitting compartments prevents them from sliding around and colliding with each other. Thus the colors are spared from abrasion and chipping. 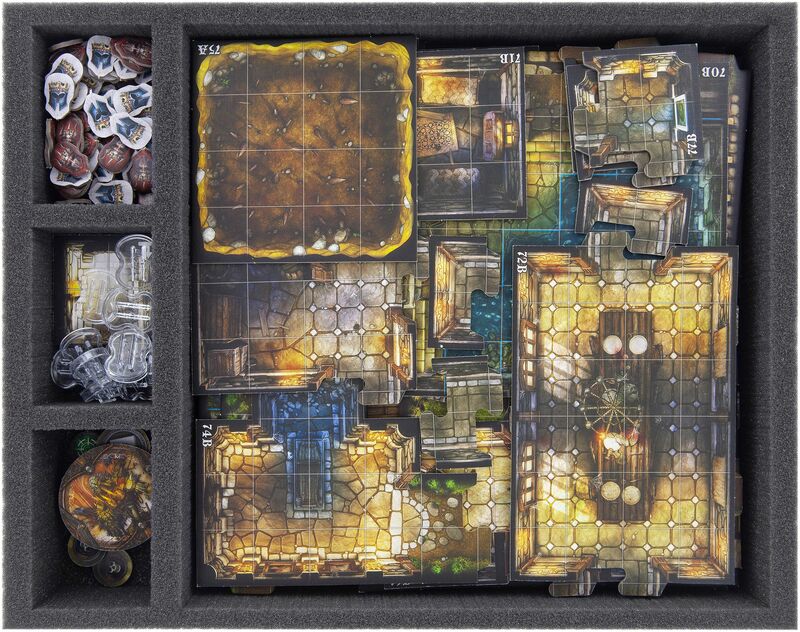 3 large foam mats help you to organize your game material. 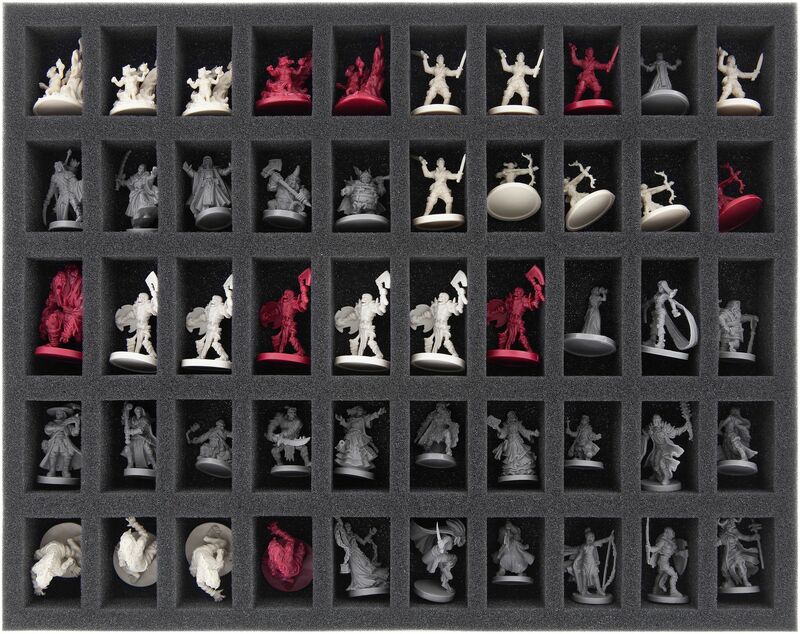 Tiles, dice and tokens can be clearly sorted into the suitable compartments so that you always have an overview and no plastic stand gets lost. 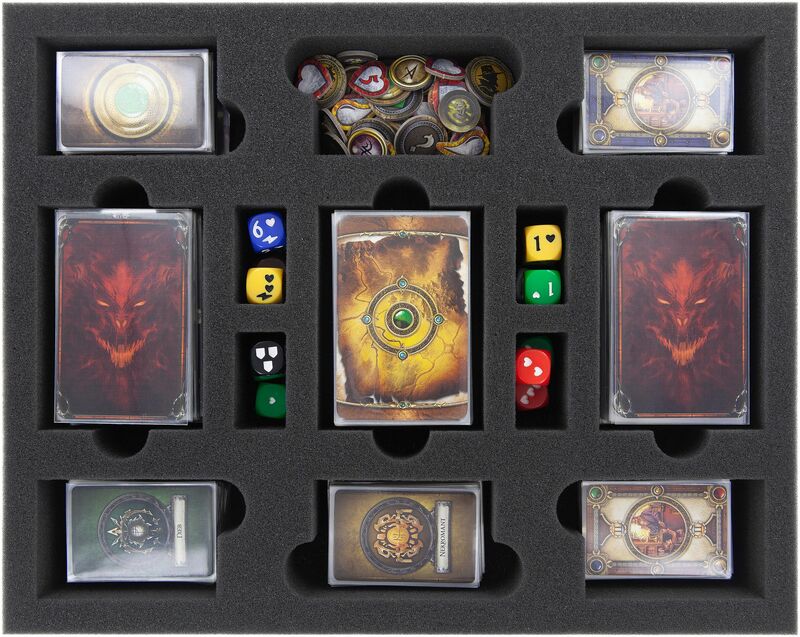 Large cards, such as Overlord and Lieutenant Cards, as well as small cards, such as Class or Shop Item Cards, fit with or without sleeves into the compartments provided. All game materials are therefore quickly at hand and the time and nerves you save for setting up the game can be invested in playing instead. 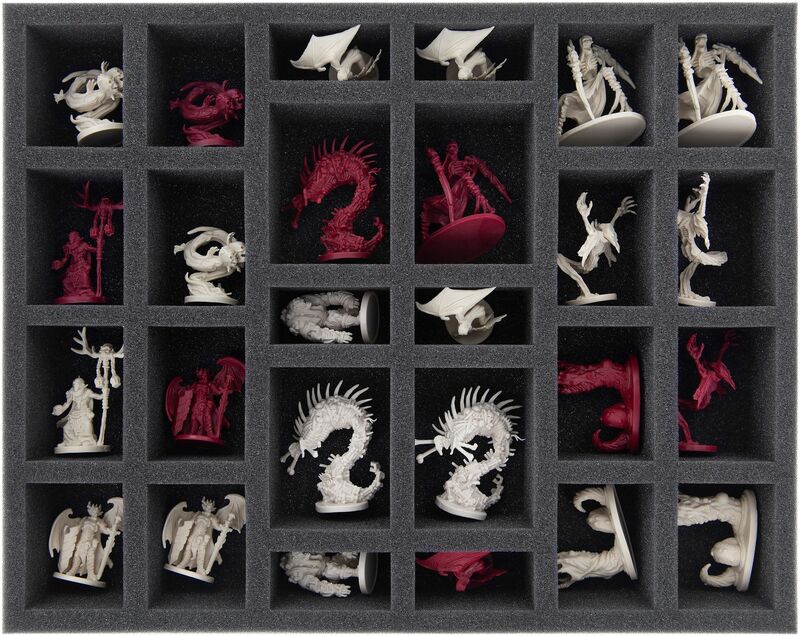 In addition, there are still some free compartments that can be filled with miniatures from the Lieutenant packs. 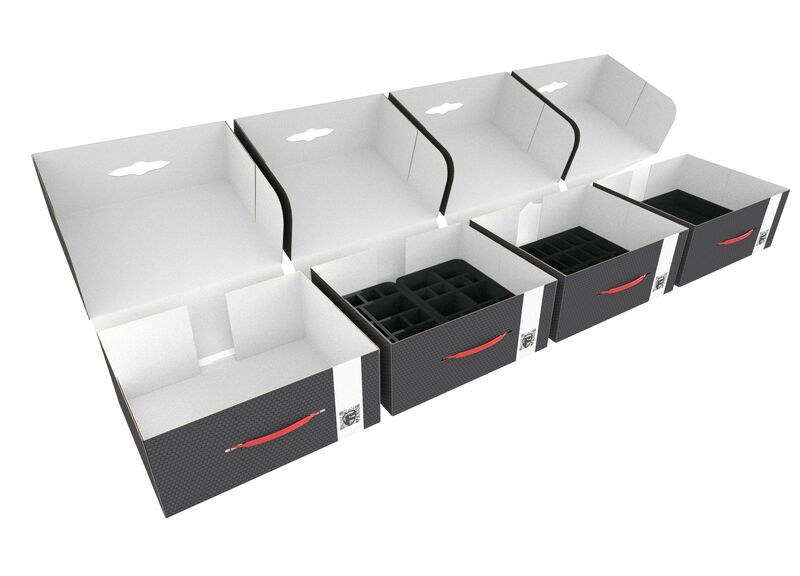 The Storage Boxes - made of double-walled, coated cardboard - are not only light, but also particularly stable and therefore ideal for storage and transport. The whole package is rounded off by the high-quality Transporter bag which makes transportation easier for you. Our Transporter bag is made of lightweight but durable fabric. 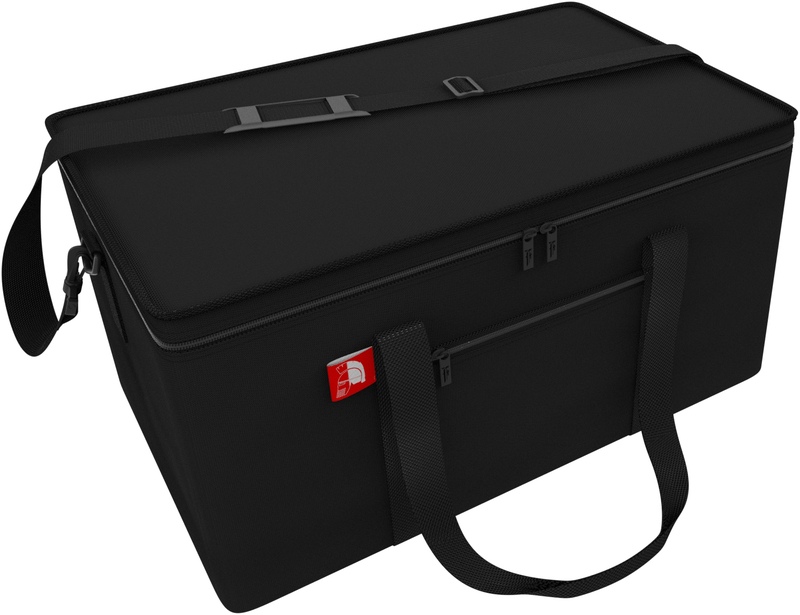 In addition to the large main compartment, the bag has a small side pocket. It can be lifted with two handles or comfortably shouldered with the sturdy shoulder strap. 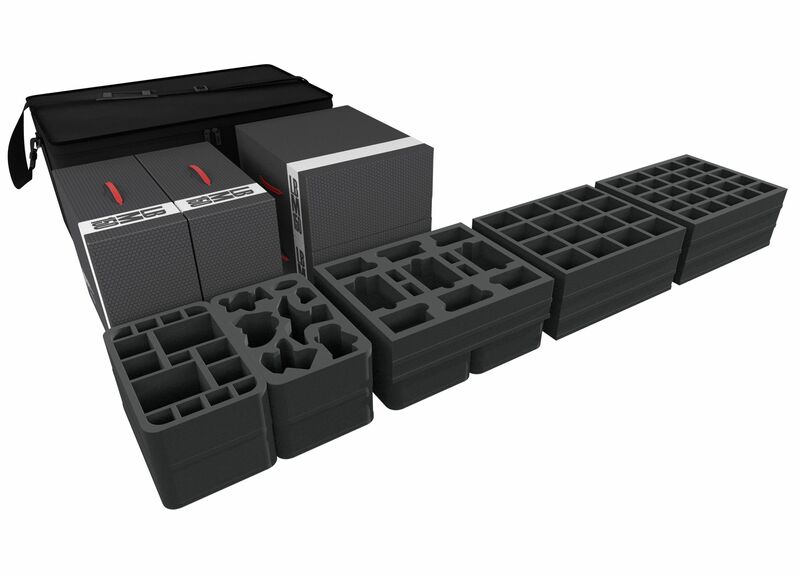 Hereby, your Descent collection is securely packed and can be transported at anytime to the next game with optimum protection.